Lettering and signs are an essential part of our visual experience and urban landscape. We’re surrounded by them. Some point the way or tell us where we are; some give instructions and warnings; and others mark a moment to remember. They can hark back to a different time or capture the current zeitgeist; they can be simple and ubiquitous, or intricate and unique. Our December party and talkFest, will be an evening celebrating all kinds of public lettering and typography. We are very pleased to partner with the Information Design Association (IDA) for this event, and delighted to have three special guest speakers: Phil Baines, Alistair Hall and Geraldine Marshall. Join us for food, drinks and good company as we explore and enjoy the history, design and production of a selection of London’s and Birmingham’s signs and public lettering. Please come along early to eat, drink and chat with fellow guests (5.45pm for 6.30pm start). We’ll be in the main room at the Gallery, Alan Baxter Associates, 75 Cowcross Street, London EC1M 6EL (nearest tube: Farringdon). 8.15pm–8.45pm: Drinks, farewells and end. Designer, lecturer and author Phil Baines will focus on remembering. He’ll give a brief account of his recent project, working with architects Carmody Groarke, on the design of the Tavistock Square memorial. The memorial, for the victims of the July 2005 attacks on the number 30 bus in London, opened in September 2018. Making it involved careful consideration of materials, words and letterforms; an understanding of the manufacturing process; and reflections on how we remember more generally. 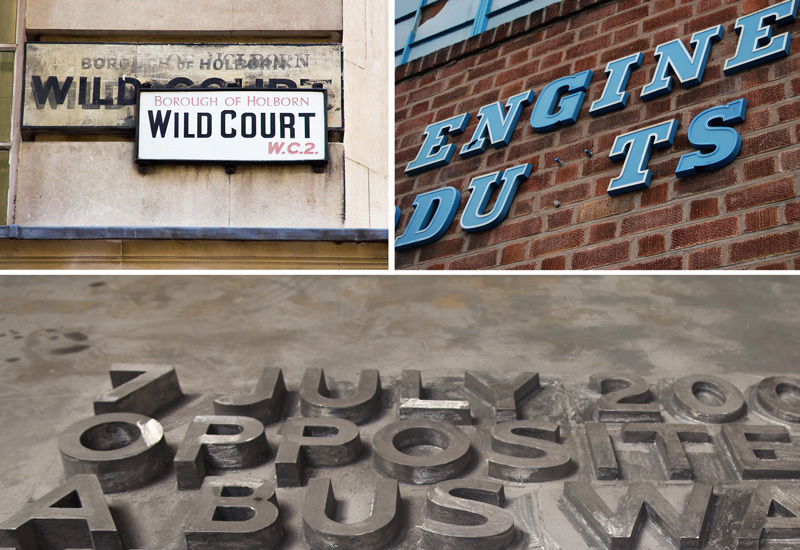 Designer, lecturer and signs enthusiast Alistair Hall will present his on-going research documenting London’s rich collection of street nameplates. All across London you can find this remarkable public archive of lettering. This is a unique collection of styles and forms stretching back to the 18th century. These signs work both as visual anchors telling us where we are, and as temporal anchors telling us where we’ve come from. Researcher and lecturer Geraldine Marshall will give an overview of her Graphic DNA in Birmingham research. She’ll also introduce the new Birmingham Sign Museum + Archive. The Archive was founded to ensure the conservation of, education about, and public engagement, with British signs. It also celebrates the historical and contemporary significance of the art of sign-making. Phil Baines has been a freelance graphic designer for many years, with clients including the Ditchling Museum of Art & Craft, and Matt’s Gallery. He has written several books including Signs: lettering in the environment (with Catherine Dixon) and Penguin by design. Phil is Professor of Typography at Central Saint Martins (University of the Arts London). He is also a member of the Royal Mint Advisory Committee for the Design of Coins, Seals, Medals and Decorations. Alistair Hall is an award-winning graphic designer based in London. He set up his design studio We Made This in 2004. He specialises in thoughtful, simple, beautiful print design. His clients include Penguin Books, Historic Royal Palaces, Jeremy Tankard Typography, the National Trust and John Lewis. Alistair is a co-founder and art director of the children’s literacy charity Ministry of Stories, and its fantastical shop Hoxton Street Monster Supplies. Alistair also teaches at Central Saint Martins and The Cass (London Metropolitan University). He has given talks about his practice across the UK and overseas. Geraldine Marshall is a lecturer in graphics, and a PhD candidate, at Birmingham City University. Her PhD is on ‘Graphic DNA: towards the application of a taxonomy’. Her research uses the Marshall taxonomy of environmental lettering (MTEL) to implement a systematic approach to recording the environmental lettering of Birmingham. Geraldine’s interests include street lettering: how it communicates, how it is perceived and how it impacts the landscape. As well as building an extensive photographic archive recording the lettering landscape of Birmingham, she recently formed the Birmingham Sign Museum + Archive. This event is open to all and free for Sign Design Society and Information Design Association members. We have a limited number of early bird tickets for non-members who book by Tuesday 4 December. SDS members: you can also email Kate (enquiries@signdesignsociety.co.uk) to register for your free ticket. Many thanks to our co-organiser and sponsor: the Information Design Association.